With Nolan at the helm and Bale steering the ship this Batman film delves deeper and is more serious than its predecessors but it works so well you can’t help but admire the craftsmanship. Since the Late 1980s Batman has gone through a number of iterations and in 2005 Director Christopher Nolan (Inception) got a crack at telling the story. His version, Batman Begins, was different from past attempts and was so well received that he was given the opportunity to continue his tale two more times, once in 2008 and again in 2012. Nolan's vision was that of a darker, more flawed character who was somewhat conflicted about his role. With a great script and a terrific cast, he brought the Batman franchise into a whole new phase that helped reinvent the caped crusader. As some of Nolan's films have now made their way to 4K UHD Blu-ray, Batman Begins is one to pick up next time you are at the store. If you don't know Batman's story you have essentially been living under a rock for the last 50 years. However, for the uneducated, Bruce Wayne watches his parents get murdered as a child, falls in a hole, gets terrorized by bats that haunt his dreams and then grows up to basically become a masked vigilante who fights crime. Oh, he's also a billionaire, which doesn't hurt when he needs new "gadgets". Anyway, In Batman Begins Nolan bridges the gap between the scared boy to the adult who fights crime in a cape. Bruce Wayne (Christian Bale; American Hustle) is a lost young man wandering Asia and making mistakes that land him a foreign prison. When he is plucked out by Ducard (Liam Neeson; Schindler's List), Bruce accepts the challenge to learn to channel his angry through ancient martial arts. Ultimately he returns to a Gotham in a state of bedlam and decides to take on the challenge of cleaning up his City. What he doesn't know is that there are darker forces at work hoping to undermine his efforts at every turn. Bale is a master of his craft and this role showcases his versatility beautifully. As the conflicted and "lost" Wayne, we watch as he slowly transforms from the young man hiding behind his pain to the adult channeling that pain into something more. Neeson is also excellent as the teacher and elder statesman who ultimately has a darker purpose. Michael Caine (The Cider House Rules) as Alfred and Morgan Freeman (Million Dollar Baby) as Lucius Fox are the perfect collaborators to Bale's Batman. Katie Holmes (Dawson's Creek) balances Bale as Bruce's love interest, Rachel Dawes. Gary Oldman (Harry Potter and the Prisoner of Azkaban) and Cillian Murphy (Inception) also need to be mentioned as wonderful additions to the group. While the 2160p 4K video quality is exceptional, the special effects left me a little disappointed. The "scarecrow effect " was cheesy and seemed amateurish in my opinion and the ice-covered mountains Wayne climbs came off as fake. The DTS-HD Master audio 5.1, on the other hand, was truly an experience to be enjoyed. Explosions utilized the entire set of channels giving them a full and robust feel. Like so many Nolan packages the extras are numerous and interesting. They include: Behind The Story -Tankman Begins, The Journey Begins, Shaping Mind and Body, Gotham City Rises, Cape and Cowl, Batman-The Tumbler, Path To Discovery, Saving Gotham City, Genesis of the Bat and Additional Footage - Reflections on Writing, Digital Batman, Batman Begins Stunts. There is also a theatrical trailer. With Nolan at the helm and Bale steering the ship this Batman film delves deeper and is more serious than its predecessors but it works so well you can't help but admire the craftsmanship. It reimagined Batman and breathed new life into his backstory, which was a nice change from the more cartoonish versions already out. 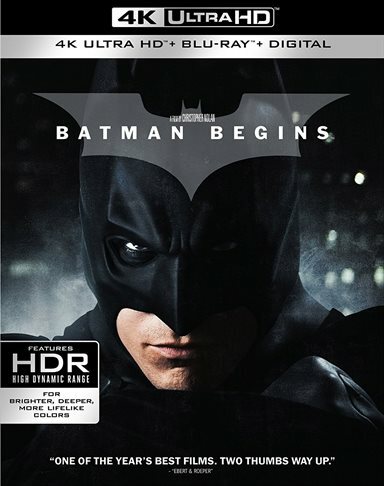 Download Batman Begins from the iTunes Store in Digial HD. For more information about Batman Begins visit the FlickDirect Movie Database.